Czech Routes is the fourth in Ben Uri’s series of exhibitions designed to highlight the contribution of émigré artists to Britain since 1900, succeeding previous exhibitions on German, Polish and Austrian artists (2017-18). Featuring the work of 21 painters, printmakers and sculptors, many of whom fled to Britain as racial and political refugees from National Socialism, Czech Routes marks the 80th anniversary of Hitler’s invasion of Czechoslovakia on 15th March 1939 (the Sudetenland, Czechoslovakia’s northern frontier, having already ceded to Germany on 10th October 1938). Nazi occupation resulted in mass displacement and by December 1939 nearly 12,000 refugees from Czechoslovakia were resident in Britain, a figure comprising 6,000 Czechoslovaks, 3,000 Sudeten Germans, 300 other Czech minorities, 1,000 Reich Germans and 800 Austrians. Of those registered with the Czech Refugee Trust Fund – a voluntary charitable organisation responsible for ‘refugees whose prominence in opposition to Nazism and Fascism had brought their liberty and even their lives into danger’, and who therefore needed ‘to be rescued’- 67% were Jewish. Portraitist and pioneering printmaker Emil Orlik made his first trip to Britain in 1898, however, the majority of Czechoslovak artists exhibited, along with Austrian expressionist Oskar Kokoschka and German photomontagist, John Heartfield (both also featured), made forced journeys to the UK immediately prior to the outbreak of the Second World War. These include sculptor Anita Mandl and painter-printmaker Käthe Strenitz, just two of the 669 Kindertransportees rescued by British humanitarian Nicholas Winton. Also represented are works by subsequent generations of Czechoslovakian artists including Irena Sedlecka, who fled her country’s totalitarian Communist regime in the 1960s, as well as those who, between the 1970s and 1990s, have made the positive decision to immigrate to Britain to study and develop professionally. The exhibition showcases work drawn primarily from the Ben Uri Collection alongside external loans from important private collections. Featured artists include: Franta Belsky, Jacob Bornfriend, Dorrit Epstein (aka Dekk), Frederick Feigl, Leo Haas, Walter Herz, Anita Mandl, Emil Orlik, Irena Sedlecka, and Walter Trier, in addition to contemporary multidisciplinary artists Tereza Bušková, Míla Furstová and Tereza Stehlíková. Curated by Nicola Baird, Research Officer at the Ben Uri Research Unit, the exhibition will be accompanied by a publication and programme of related talks and events. 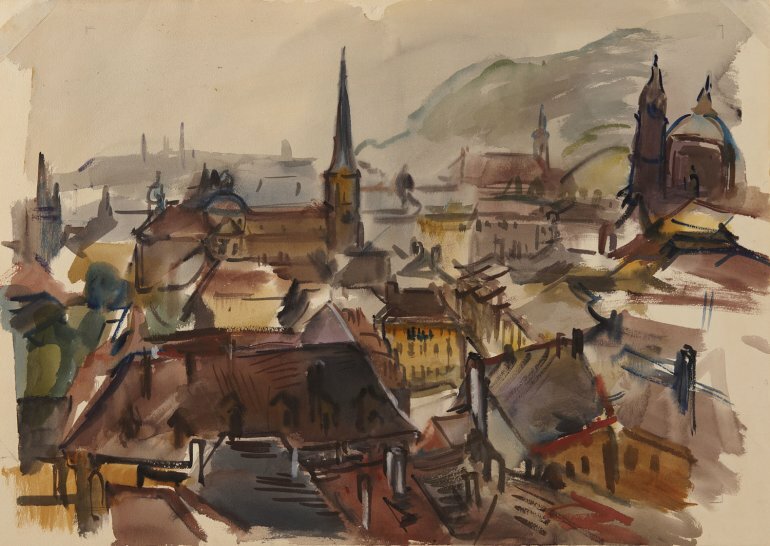 Czech Routes marks the launch of the Ben Uri Research Unit (BURU) which will embark on an extensive research programme exploring and recording the contribution of Jewish and immigrant artists to Britain since 1900.